Calling all vets, techs and clinic staff! 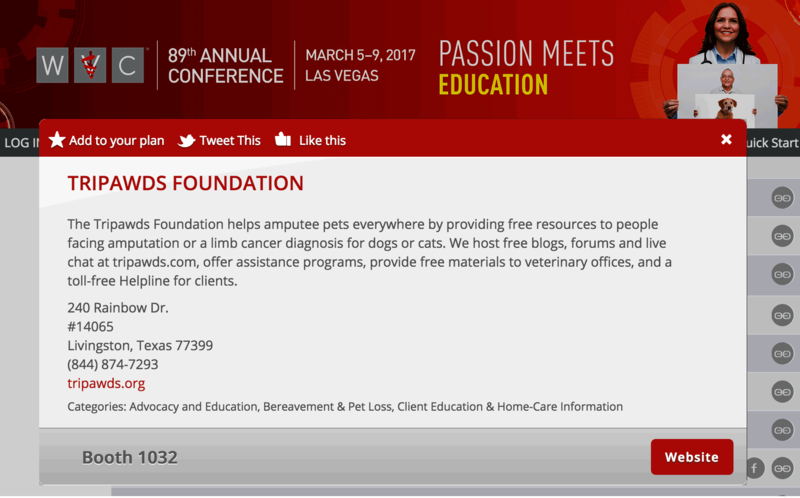 Drop by the Tripawds Foundation booth #1032 at WVC 2017 March 6-8 at the Mandalay Bay Convention Center in Las Vegas, Nevada to meet Tripawds spokesdog Wyatt Ray and pick up some free patient education materials for your pet amputation clients. In our continuing efforts to educate veterinarians, vet techs, and clinic staff about all our current pet amputation assistance programs, the Tripawds Foundation is pleased to announce our second appearance at a major veterinary industry conference and exposition. WVC is dedicated to providing the highest quality year-round continuing education to veterinary health care professionals by engaging recognized authorities to deliver valuable information utilizing innovative and effective methodologies, that enhance animal and human health worldwide. For five days every year, the best and brightest in the veterinary industry congregate at the Annual WVC Conference for the most practical professional development available. Attendees learn from expert instructors and gain knowledge to apply in their veterinary practices all over the country, and around the world. At this year’s conference, the Tripawds Foundation booth in the exhibit hall will offer free patient education materials and an opportunity to meet Tripawds founders Jim Nelson & Rene Agredano. Spokesdog Wyatt Ray will be available for photo opportunities, and videos will constantly be showing amazing dogs and cats loving life on three legs. Nearly 15,000 veterinary professionals are expected to attend the WVC Annual Conference March 5-9 in LAs Vegas. More than 6,000 attendees are veterinarians. Approximately 90% are from the U.S. and 10% from other countries. “We are looking forward to learning about the latest advances in surgery, oncology, rehab and pain management,” says Agredano. “We also hope to interview veterinary experts for the Tripawds News blog and Tripawd Talk Radio,” she adds. 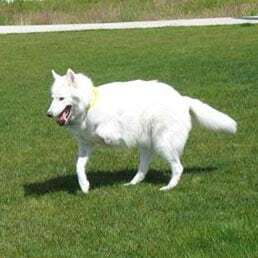 The Tripawds Foundation helps amputee pets everywhere by providing free resources to people facing amputation or a limb cancer diagnosis for dogs or cats. We host free blogs, forums and live chat at tripawds.com, offer various assistance programs, provide free materials to veterinary offices, and a toll-free Helpline for clients. If you will be attending WVC 2017, please leave a comment or contact us here so we can schedule a time to meet. Or drop by booth #1032 in the exhibit hall. Follow Tripawds on Facebook or connect with Tripawds on Twitter to stay informed about the latest news and program announcements!